Delhi Technological University (DTU), formerly known as Delhi College of Engineering (DCE), is a premier government university located in New Delhi, India. It is one of the oldest engineering colleges in India and Delhi's first engineering college. Delhi Technological University is also accredited as the mother institution of a number of national projects including Indian Institute of Technology Delhi, Netaji Subhas Institute of Technology, School of Planning and Architecture, Delhi, College of Art, Delhi and even the famous Faculty of Management Studies. Delhi Technological University (DTU) has been ranked 5th among all Engineering Colleges[Source: Wikipedia] of India by India Today. Various renowned personalities of several technological fields such as Mr. Vinod Dham, also known as Father of Pentium chip; N.A.S.A’s distinguished scientist Dr. Yogesh Sud; Prof. Yogesh Goswami, distinguished Professor of Solar Energy Technologies, University of Florida; Mr. Rajeev Katyal - Director Education – Microsoft, are some of the alumni of Delhi Technological University. From the same of corridors of Delhi Technological University as of our alumni, and following their path, I wish to contribute towards the growth of science and technology. Mentored by Dr.S.Indu and Prof. O.P Verma. Working on deep learning models for robust visual feature representations. Worked on the MediaWiki:Cargo Extension project for the task "Add a hierarchy type to the Cargo extension" at Wikimedia Foundation. This task was done during Summer 2017. Web Developer for IEEE‐DTU & Troika, Annual Tech‐fest DTU. Optimizing OpenMPI implementations of certain cryptanalysis algotrithms using Intel Parallel Studio. Designed and optimized system for accurate Air Drop, Camera Gimbal, UAV positioning Web App and onboard Geotagging of live feed from the UAV on Ardupilot library. I'm a Member of Technical Staff (equivalent to Software Devloper) at Adobe Systems, India. Technology drives me since my childhood. Technology improves quality of life, facilitates an organisation to accomplish loads of work and generate great amount of revenue, & does tasks which humans cannot. I'm extremely passionate about intelligent systems powered by fundamental concepts of computer science and electrical engineering. My research interests include Deep Learning, Evolutionary Computing, Computer Vision and Internet of Things. Surveillance and Tracking Computer Vision | Distributed Systems. Object detection and tracking research has largely focussed on improving performance over contrained subspaces, largely restricted to single camera scope. Motivated by enhanced tracking needs in recent times, we worked on near-real time path retrieval over distributed geospaces.Used unsupervised deep learning techniques to generate compact component based feature descriptors.Deployed the same over a multinode Apache Spark cluster.Worked with the Spark Streaming module to obtain real-time processing.Obtained processing time of 10 ms for 300 queries using 6 component feature vectors over a multinode cluster. Developing effective Solution for Indoor Positioning of a node in a predefined indoor geo‐subspace. Comparing localization techniques used for positioning indoors and generalising their areas of usability by simulating in an indoor geo‐fenced environment. Obtained a 72.8% mAP precision. Image Processing | Deep Learning Inspired by a research paper by Google Inc.,designed our own DCNN model to detect objects in video streams. Employed morphological operations and transformations for feed stabilization and preprocessing. Trained the model specifically for cars by using a popular dataset hosted by UT-Austin and picking off CCTV feeds from the internet.Obtained Compared the model performance with more traditional cascading techniques. A user application focussed on sending SOS messages without any cellular network at the point of distress. The applications employs Connectionless Datagram Packets to communicate distress/SOS messages to the near pears. 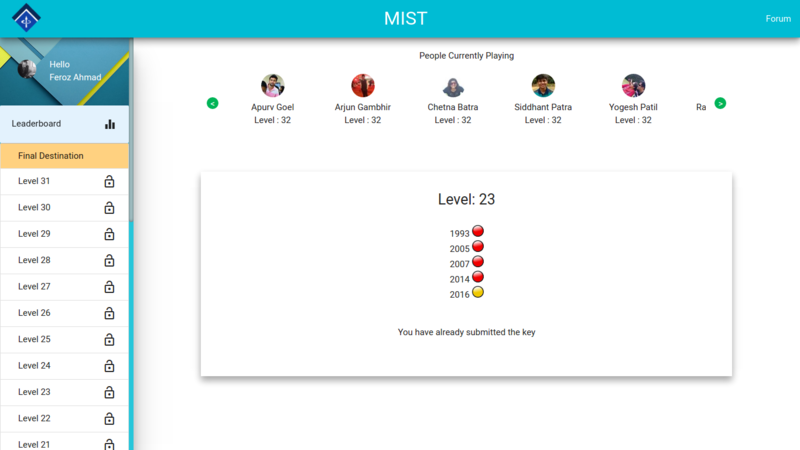 A Web Application developed for Online Quizzing Event - MIST - hosted by IEEE-DTU, focused on optimized multimedia delivery for a flicker‐free experience. Enjoyed by 1,500 users, producing 65,900 page views . The application was in production for more than 1 week. A Web Application Simulator developed for Virtual Online Stock Market - Bulls n Bears - hosted by IEEE-DTU. The application was in production for a span of 3 days. Minor course project for semester of Fall 2015. Obtained the Best Project Award. Developed a prototype to facilitate wireless mobile enabled control of appliances in domestic setting.Employed a multi-server architecture, where a global control server interacted with local servers hosted on a raspian system.A client side application was used to issue commands for manipulation of various devices characterised by binary signals. Wardrobe manager and recommender consumer-end application to support smarter buying among customers with a social platform. Used a supervised classifier to characterize similarity of clothing in a wardrobe. Designed and trained our own Deep Convolution Neural Network model to classify clothes into 15 different categories to aid automated recognition. Grand prize winner at HackEnvision 2016.